Hello all, I know its been a long time since I last posted, a lot going on here. Most importantly, my new book, Advanced PLC Hardware and Programming, is officially on sale! Final edits were done last week, and the official release date was April 8, 2019. I ordered a physical copy and after inspection decided to have it printed on a heavier paper even though it cost me a bit more. It’s a pretty big book physically, 8 1/2″ x 11″ x 0.94″, 346 pages and 2.4 lbs. The information density is pretty high, but there really is a lot of advanced stuff in there. My class manual, PLC Hardware and Programming Multi-Platform, makes up the first part. This is a generic approach to PLCs with 12 exercises explaining most of the basic PLC hardware and software concepts, including all of the typical instruction types found in PLCs. It also has a pretty good history of PLCs and computing devices and most of the basic PLC math concepts you need to know. The second part I call “The Art of PLC Programming”, and it goes into more detail about the types of routines used in industry, and most of the concepts found in the PLC tab on this blog. It also describes some of the different kinds of training equipment available, leading to the final exercise, which is writing a program for the Fischertechnik Trainers I have discussed here. 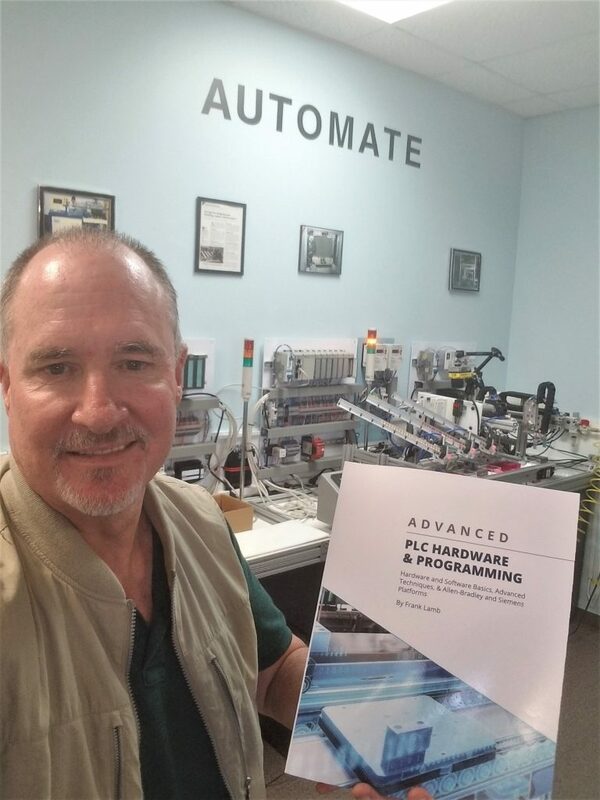 The answers to all of the exercises and a printout of the completed trainer program for the Color Sorting Conveyor application is printed in the back of the book. The final section of the book is specific to Allen-Bradley and Siemens PLC platforms. There are full instructions for building an Allen Bradley program on both RSLogix500 (SLC and MicroLogix) and RSLogix5000 (ControlLogix and CompactLogix) platforms. The same is true for Siemens, I made complete instructions for programming both Siemens Step 7 (S7-300 and 400) and TIA Portal (S7-1200 and 1500). Most of the instruction sets for all platforms are there, plus a pretty complete description of the hardware. Lots of advanced material there too, including AOIs, Tasks/Programs/Routines, OBs, FCs and FBs and the way all of it fits together. Overall I think its the best book available anywhere for PLC programming, but of course I am quite prejudiced since I wrote it. I’d love to hear your feedback, and if you buy it on Amazon I’d like an honest rating. When I had my first book Industrial Automation Hands On published, I had no control over much of anything. McGraw-Hill was the publisher and the priced the book and even picked the name. This time, I published it myself under my company name, Automation Consulting, and had it printed through Ingram Spark. It is still available at all bookstores and outlets, but I was able to do everything my way. My daughter’s company, Huckleberry Branding, did the editing and the cover, while I did everything else. So now I have the ability to publish books for myself and others, let me know if you have an automation-related book that YOU want published through my company! One thing McGraw-Hill did was sent books to a bunch of reviewers for free. There were three problems with this. One: most reviews now are on Amazon, and the books were not purchased from Amazon, so they don’t show as verified purchases. Two: Since the books were free, it is hard to say that the reviewers had an unbiased opinion. Three: for me, the books cost money to print and ship. And once again, even if I sent a copy to prospective reviewers, they wouldn’t show as verified purchases on Amazon. So I really don’t have much of an answer for this. It is up to me to promote and advertise the book as much as possible. If you clicked the link at the beginning of this blog, it goes to the Amazon page for the book. It is advertised for $65, which is the list price I entered into Ingram’s site based on the printing cost. I will be selling the book on my website and on my new Amazon storefront “The Automation Arcade” for $55, but it will be a while before either are active. I also can’t ship for free like Amazon can. So anyway, I hope you buy the book, I think it is worth it. If you take a class from me here at my place in Tennessee, the book comes with it. Again, I think it’s the best, most advanced PLC programming book in the world, and I hope you agree.